Marilyn, D+R's chief uber-recommender, points us to an interesting Kodachrome exhibit at the National Geographic Museum - The American Tourist in Europe. 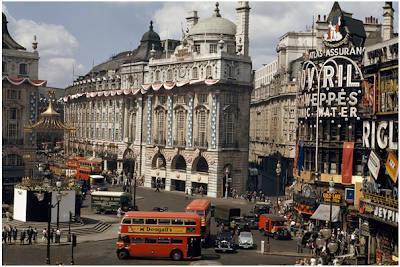 As the globe opened up through the jet age, Kodachrome accompanied tourists to photograph the world as amateurs. Now, we take for granted digital cameras in our phones to capture moments but, not that long ago, color photography was an epic cultural shift. And, where I first learned of Kodachrome's demise, Xeni's BB post on Kodachrome and the influence on Glen Friedman.